Token burn is a process of sending an amount of tokens to a wallet address — commonly referred to as the “black hole” — where the private keys are unobtainable by anyone. This process makes the tokens unusable forever and cannot be undone. Why are Token Burns Necessary? Token burns will keep the token value at a healthy level and importantly embrace the importance of scarcity as the supply of the tokens in circulation is intentionally decreased. Economic principles have proven that this is an effective method and a reinforcement for the respective project’s growth. 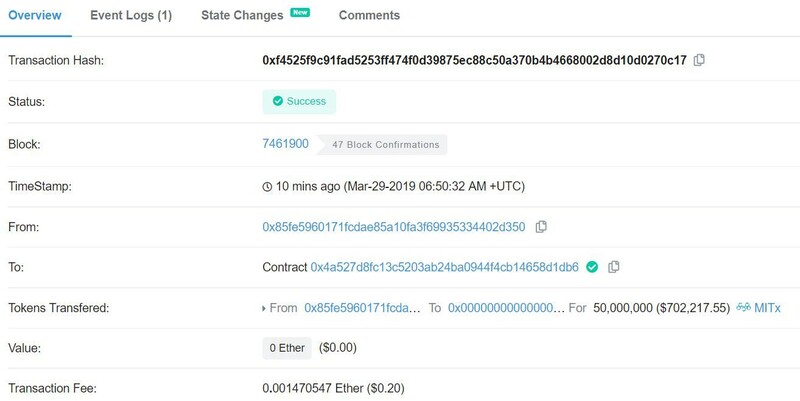 The team has just executed a token burn of 50 Million MITX, with the proof-of-burn shown in the image below. We will be conducting monthly token burns progressively throughout the next 48 months. The burn will be capped at a maximum of 45% of the initial circulating supply (450M MITX out of 1B), leaving us with an estimated supply of 550M MITX tokens. The final circulating supply might vary due to some of these tokens being used for exchange listing fees or other similar expenses that might arise during that time.